You know it must be Spring when Woody The Woodpecker comes out of hiding! Beautiful!! We see a lot of these woodpeckers during the Spring and Summer months in our backyard. 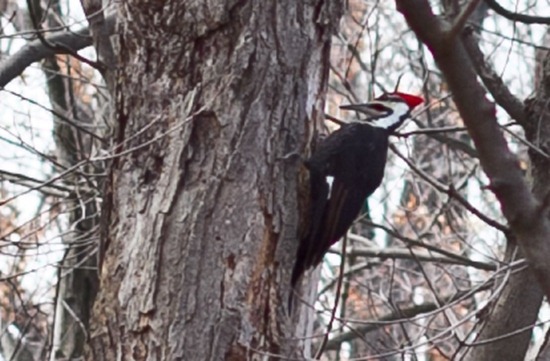 Male Pileated Woodpeckers have a red stripe from their bill outward, while female Pileated Woodpeckers do not, but both the male and females have the red crest on top of their heads. We aren’t sure if this one is a male or female because it is a bit hard to make out in the picture whether this one has a red stripe from the bill. It looks like it does, but I’m not positive. Anyone know? I had to zoom in this photo a lot and unfortunately the quality isn’t that great! Yesterday, Eric and I had Spring Fever pulsing through our veins and we went on three walks! It wasn’t even warm out, but we just needed to get in the sunshine and feel it on our faces. I’m pretty sure our neighbours think we are crazy, although I’m sure they have known for a while after seeing me take pictures of my food all last summer. The conclusion: I really love walking and I don’t do it enough! It also seemed to help the horrible cramps I had yesterday too. When we returned, a plate full of freshness was just what the Doctor ordered. And then I fell asleep at 8:30pm on the couch, stumbled up to bed at midnight, and woke up just after 7am. I guess my body needed one last hibernation for the Winter? At any rate, I feel like a new girl today. The fresh dill I bought from the grocery store just keeps on ticking. Luckily, it seems to be keeping quite fresh in the crisper. I have had lemon dill hummus on my mind all week long, so I used my Favourite Hummus recipe and added a bunch of fresh dill to it. You simply prepare the hummus according to the directions here and add in the minced dill and process it some more until combined. Easy peasy! It turned out great with a very fresh dill flavour. Two thumbs up! We are off for our first hike of the season today. I wish it was warmer out (it’s about –4C right now), but we’ll have to bundle up and make do. I’ll bring the camera along and hopefully we will see some fun creatures out and about celebrating the first day of Spring! Yummy hummus!! I love to have different types of hummus in my back pocket. I have been LOVING all of the birds that have come out in our yard in recent weeks! Outside of my office window, I have a ledge that I fill with birdseed, and I could watch them for hours! It’s not very conducive to getting work done though, ha! 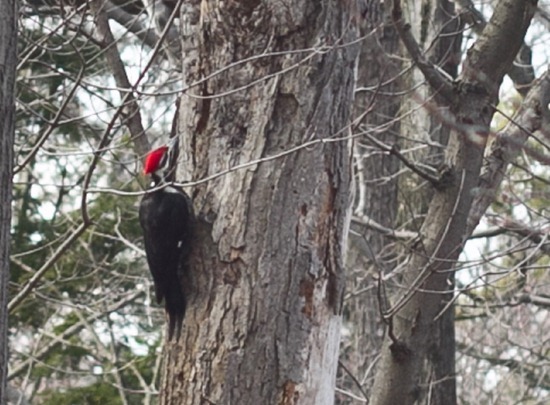 What a beautiful sign of spring with the woodpecker! And I completely agree on the walking… something about the warm weather makes it THAT much easier to get out for a walk. I have loved walking for years and put in the effort to go for one every day. Such a great use of that dill! Fabulous photos! More dill! I love it. So good. Yum! I”ve been on a dill kick — eating dilly beans and making a dill yogurt sauce to go along w/ falafel. 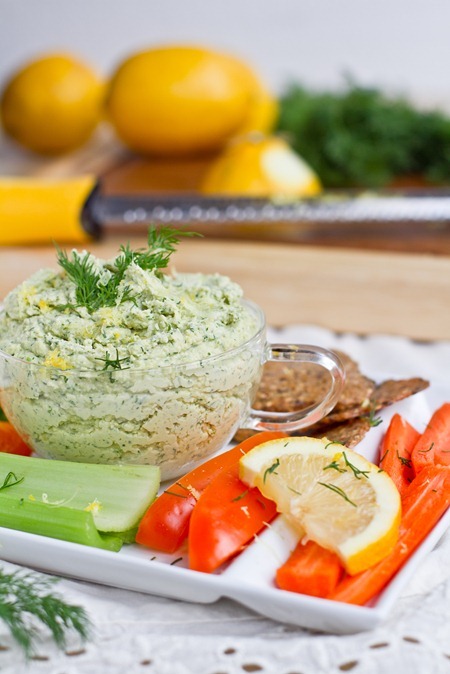 This hummus looks so yummy — lemon and dill are a lovely combination! I’ve heard these woodpeckers but I’ve rarely (if ever) seen them!! Awesome pictures! I just bought some dill yesterday and this looks like an awesome way to use it! I’m in your neck-of-the-woods too, and I YEARN for some warm weather! Isn’t it nice to see the birdies back? 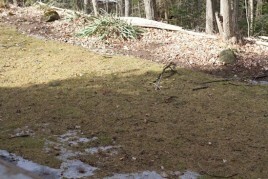 And the snow is almost gone. I’m going to get outside for a long walk today too. Shame we have to bundle up to do it. I love walking too and find I don’t do enough of it in the winter. I love fresh dill! Hummus never gets old. Looks yummy! Lemon and dill are such a classic combination. I’ve put them both in yogurt dip before, but I’ve never added dill to hummus! Mmm hummus, one of my favorites. I love the freshness of the lemon and dill. Lemon + Dill + Hummus — that is pure comfort food for me. 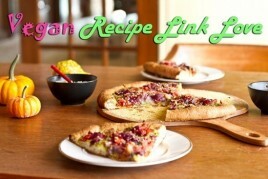 I can’t wait to make this — so missing my Cuisinart right now :) Have a great hike. Now that is a woodpecker! Whoa! How refreshing, dill and lemon, yes! Aw what a cute bird! We have a family of blue jays living in our backyard and I want to get a bird feeder so bad! I love hikes. It’s nice and sunny here… Maybe i’ll go play around in the sunshine too ;). It’s amazing what a great night of sleep does for the body. I love walks! Especially when the sun is out and the air is so crisp like today! 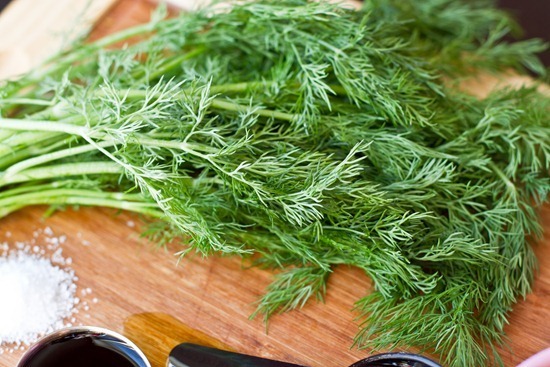 dill is one of my favorite herbs! I am actually making tuna-dill patties for dinner tonight and I think I might just have make a batch of this to use as a topper! Yum! I love fresh dill! 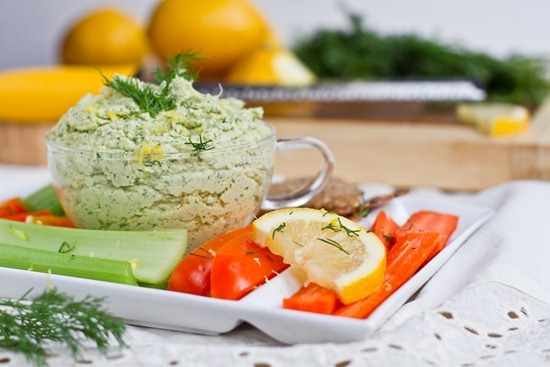 Lemon dill hummus sounds so delicious! Oh, I love dill! I haven’t made homemade hummus yet, so looks like I need to run to the store for a few missing items;) I need to start a blog so that I can start sharing some of my favorite recipes. I love trying new recipes and I have so many that need sharing. I started thinking about this last night when I made a spring/summer favorite. Basically, it is just greens topped with strawberries, blueberries, raspberries, almonds, green onions and lots of dill. Then a very easy to make vinaigrette and you have a show stopper. I like to bring this to barbecues in the summer and now that I am on my way to being a vegetarian I know that I can fill up on this for sure:) You will love it if you love dill. Yum, I just love hummus. I don’t use dill nearly enough and this is a great new way to try it! Enjoy your hike. It might be brisk out, but it sure is nice to be outside with no snow! 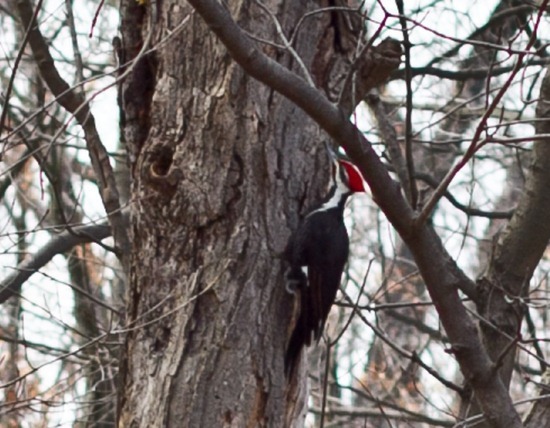 We have pileated woodpeckers in our backyard too! We love them. We saw two of them fighting days ago, I’m going to assume they were both males. I tried to plant dill last fall so I could have it fresh for whatever I wanted but I don’t think I did a good job. I have the complete opposite of a green thumb, ha. Your photography rules. As do your recipes. All hail the queen! I think the moon was too close to the earth and was making all of us feel a little “icky” girl pain wise. 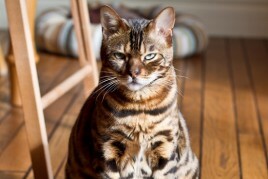 *wink* Hope you’re feeling better. It’s pouring rain here in LA. What a first day of Spring! I’ve been referring people to your website, both for Green Monster Shakes and running tips, as you’ve been very inspiring to me. Keep up the good work. yup totally blame the full moon! I don’t know where you live but in my part of the province is almost +5 I think? It’s gorgeous out. I’ve been out for a walk, but have to do work inside so stuck as usual. I kind of don’t mind being in though either (just feel guilty for it!). Do you work on the weekends? Are you still running as well? Oh and I mean BESIDES all the blogging you still do on the weekends of course! Wondered about the bakery and your writing process. Your photos are just stunning Angela! I heard a woodpecker yesterday morning during my run — it was so nice to see and hear birds — it means Spring is almost here! I have never thought of adding dill to hummus! I should get some at the store and try that out in my next batch! Wow, those woodpecker photos are so cool! I have a woodpecker that likes to hang out in the trees behind my apartment building. It is nice to hear all the birds sing in the morning along with the woodpecker. I hope your hike was nice despite the weather. Mmm…lemon and dill…what a lovely, refreshing combination. Yum! Perfect way to jazz up hummus! I need to give it a try. And woody the woodpecker…GREAT SHOT! i always seem to forget about dill when I am cooking, but thats a great idea to incorporate it! shake things up! I don’t know how to put a photo in the comments section but you should check out my hot pink hummus! It is all natural and sooooooo fun and tasty!! http://www.jodiecope.com/2010/12/holiday-hummus.html if you want to take a peak. The woodpeckers have been waking us many mornings lately, they love our telephone poles. YUM. I used to ‘hate’ dill, but as I got ‘older’ (lol) I realized that I don’t care for dried dill, but LOVE fresh. What a great idea to add it to your hummus. 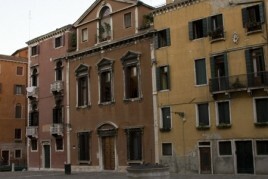 Very spring like ;) you pictures are so pretty!! Makes me want to make some right now. Yum! The Summerfresh Lemon Dill hummus is one of my favourites and I imagine it would be even more delicious fresh. I can’t wait to try it! my oh my – this looks so wonderful! oh how I love hummus! Dill is such a great addition.. 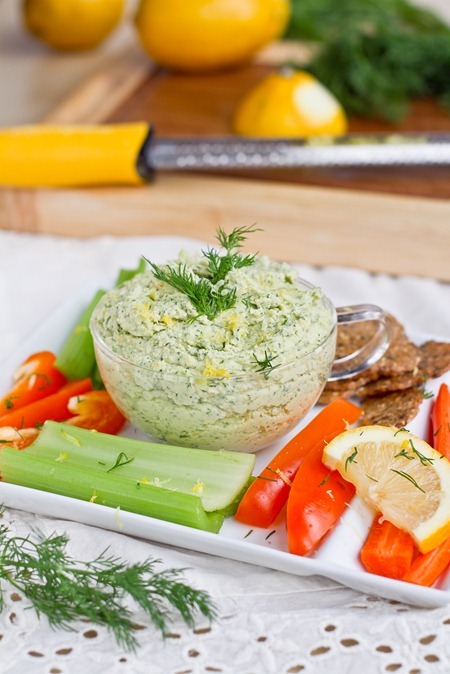 I love the idea of dill in hummus – dill is such a nice, spring-like flavor. Looks great! I love dill but never thought of adding it to hummus! Must be delicious :). This hummus sounds amazing:) Going to have to go buy some dill! Love the color of this hummus! It looks so fresh and delicious! We can never have too many hummus flavors, can we? Awesome recipe! I love dill. I’m so delighted that you got to see a real woodpecker! We don’t have those in Australia! Hibernation feels so good, no matter the season! That hummus looks like it tastes like spring! I’m not exaclty sure what spring taste like, but its fresh, smells good and is very yumm! I can’t wait for the temperature to rise just a little more! You just inspired me to pick up some dill tonight! Just made this hummus after searching for some oil-free recipes. In one word: delicious!